Arsenal made it five Premier League wins in a row here with a straightforward victory against a well-drilled but pallid West Ham. In the process Arsène Wenger�s team kept up the pressure on second-placed Manchester City and played some delightful attacking football with Mesut Özil, Olivier Giroud and Aaron Ramsey all combining beautifully. If at times in the second half Arsenal seemed a little distracted, a team with half an eye on ticking this match off and readying themselves for a more gruelling challenge in the Champions League in Monaco, they can at least be sure Leonardo Jardim�s side will provide a much sterner test than these listing, drifting Hammers. This always looked like the kind of match Arsenal have made a habit of winning in recent times: a top-four run-in banker on a spring day at the Emirates against opponents who have so often found their fluent attacking movement too much to handle. The big news before kick-off was the return to Arsenal�s starting lineup of Theo Walcott, shadowed by contract negotiations but given a chance here to start with Alexis Sánchez on the other wing in an Arsenal attack full of pace, mobility and Giroud. With five minutes on the clock Walcott had the first sight of goal. He should have scored, too: played in by a lovely sniping pass from Özil and a clever flick from Giroud, he dithered, allowing James Collins to make a fine saving tackle. Moments later the Emirates saw the first glimpse of more progressive things from this high-throttle forward line as Walcott sprinted across halfway and funnelled the ball on to Sánchez, who checked back on to his right and the chance was gone. For West Ham Matt Jarvis returned on the left of midfield and Joey O�Brien stepped in at right back in a 4-5-1 formation designed with gristly defence in mind at a ground where, despite his reputation for Wenger-baiting, Sam Allardyce has never won a game in 12 attempts. West Ham did show some nice touches in attack at times. With 22 minutes gone Kevin Nolan, who until then had occupied himself by simply bumping into Özil at every opportunity, might have opened the scoring. 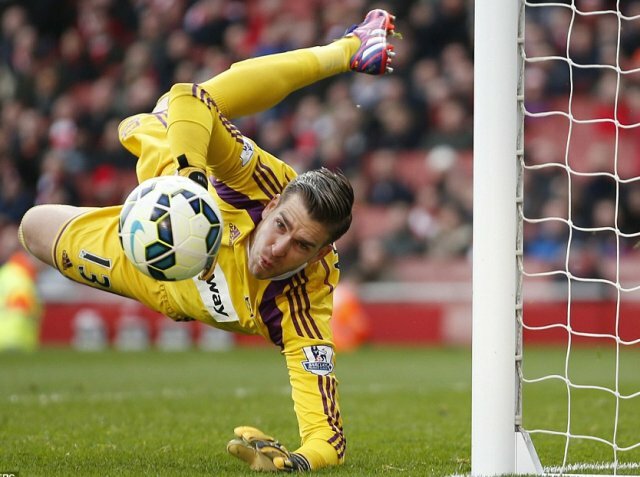 Jarvis crossed from the byline and Nolan�s well judged volley brought a swift low save from David Ospina. Arsenal continued to press and 12 minutes before half-time Walcott found himself again through on goal, following a fine through pass from Ramsey. This time Walcott shot straight at Adrián. The chances continued to come, the next after a dreamy exchange of passes between Özil, Walcott and Ramsey, at the end of which Sánchez�s fine volley drew an equally good save. There was still time for Walcott to miss another presentable chance before Giroud finally made it 1-0 just before half time. It was a beautiful goal too, as Özil and Ramsey exchanged passes, Ramsey�s dart and Özil�s sliderule through ball leaving Giroud with just enough angle to shoot hard into the top corner across Adrián. It was fitting reward for a first half in which Arsenal enjoyed 74% of the possession and had 12 shots at goal. But West Ham did offer a little more after half-time, Mark Noble and Alex Song taking a grip of central midfield and the hitherto invisible Diafra Sakho showing his mobility and touch across the frontline. Seeking a little extra muscle, Wenger brought on Danny Welbeck for Sánchez and Santi Cazorla for Walcott, who as so often looked a high-pedigree footballer here 95% of the time, that missing 5% usually involving either shooting at goal or finding a final pass. Still Arsenal stitched together some lovely moves, with Özil�s passing at times drawing gurgles of approval, although he really should have shot rather than crossed after a fine exchange with Welbeck left him clear in the penalty area. With eight minutes left Ramsey finally made it 2-0 after another sensational combination with Giroud, a one-two after a throw-in leaving Ramsey in on goal for a sweet close-range finish. And within two minutes it was 3-0, Mathieu Flamini scrambling the ball in from a cross by Cazorla for his first goal since last March.